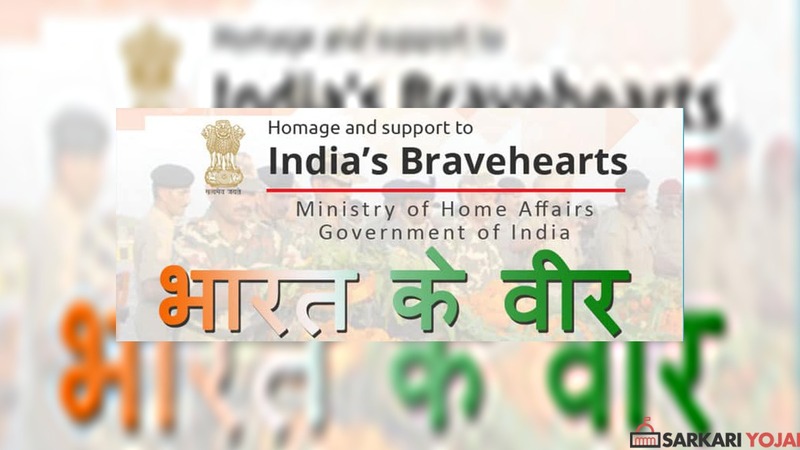 bharatkeveer.gov.in or Bharat Ke Veer is a new web Portal launched by the central government for the general public to make donations to the families of martyrs and soldiers of Indian Armed forces. 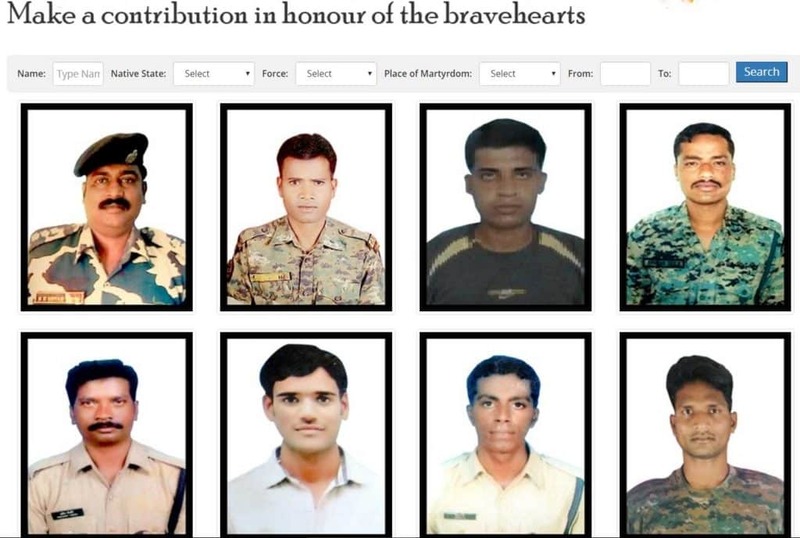 Using the bharatkeveer.gov.in portal, anyone who wish to support the families of martyrs can donate online. The web portal and app has been launched by the Ministry of Home Affairs in order to pay homage to the brave-hearts who have laid down their lives in order to protect their country and citizens. The main objective of the Bharat Ke Veer portal is to enable general public help the families of martyrs by donating money online directly to the individual braveheart’s account or to Bharat Ke Veer corpus. Braveheart’s from the following armed forces are among the major forces included in the Bharat Ke Veer Portal for contribution. Following is the procedure to make the online donation/contribution to the individual account of the braveheart’s. Then you need to click the “Enter” button from the homepage. 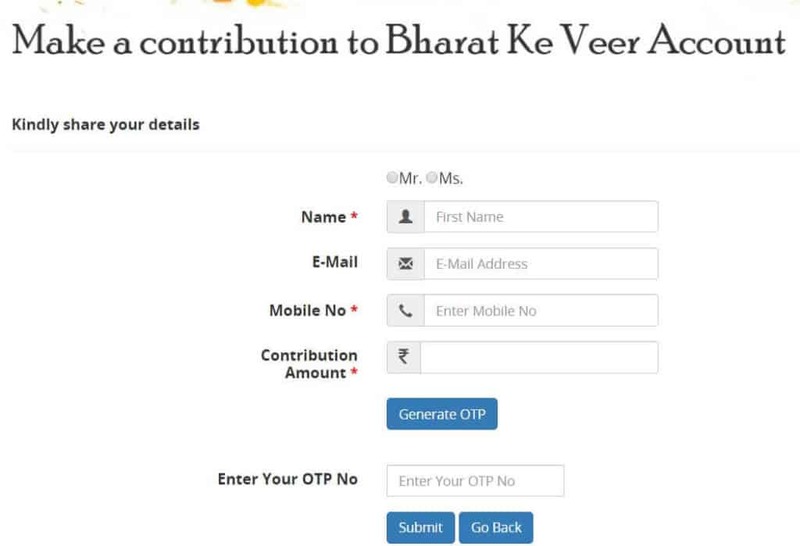 If you want to make contribution to the individual account, then you need to click the “Bravehearts” link in the menu or if you want to contribute to Bharat Ke Veer corpus fund then click “Bharat ke Veer” link in the menu as seen in the image below. Upon clicking the “Bravehearts” link, you can select the individual soldier from the displayed list or search one and make desired contribution. If you want to donate to “Bharat Ke Veer Corpus”, then simply fill the details and amount to be contributed as shown in the form below. After contribution, one can also download the certificate of their contribution by entering their e-mail ID and phone number at this link. The amount donated through Bharat Ke Veer Portal bharatkeveer.gov.in will be credited to the account of ‘Next of Kin’ of those Central Armed Police Force/Central Para Military Force soldiers. I would like to donate some amount for 40 CRPF jawans died recently i can not see names ? can i donate thue HDFC bank net banking? Very thanks so much sir,. I respect to your sir this great work for our bravery martyers. But I request to you sir that there are many martyrs femilies doesn’t given benifits. Please sir all conditions be a soldiers during on duty incident involve this app benifits so that these families and his children get well education and do good in future and named our martyr father and our nation. Please sir these request be involved this app and good for martyr’s families. This all condition I fell sir because sir my father is a martyr in bsf 141 BN 29 Nov 2005 at j&k during on duty. My father’s all details sir name- Hc Saradara Ram Gurjar no. 860057798,141 BN bsf please contact me sir be onwer and handle this veer Javan app. My name Dayal Singh Gurjar mob no. 08104761675 please our help sir again request for you. Most of the people do not believe even till today that this is a genuine website and the money so contributed will reach our defence personnel. The above disclaimer again adds to confusion. We also have come to know that defence ministry has opened an account in Syndicate Bank for the same purpose. Can anybody authenticate ? Good think akshay sir ji and rajnath sir ji,i proud of u.i like indian army. how to pay for the jawans is not clear yet . pl let us know the process of doneting. This is very great idea I ever seen .Thank you Akshay sir and Indian government. akshay sir salute for you given good idea you’re great and you thinking is very strong so i again salute thanks. I want to contribute for the good cause. I live in Canada and don’t have bank account in India. akshay sir, salute to u the my core of heart for this greattest work for “bharat ke veer jawan ” I always want that something doing for “bharat ke veer jawan”sir ,am student . I always excited to see u & get very enery & very learn to u sir. I have a problem not mine problem it rular indian people prob. most people don’t know that”how to send money for this website by online net banking .because now day also 70% rular people have not smartphone ,only very simple phone. sir ,I request to u that sir ,provide a simple way to send this money.as that ,this website conected all bank by cheque transfer process &indain post system .by which all indian people connected this site. sir my request will sure liked ,I hope because i also belong to village .sir thanks &a lot of loving to u sir &”bharat kr veer jawan”, jai hind sir. Thank u Akshaya kumar ji and PM Modi ji for creating such a web portal .This is a good initiative to support bravehearts’families who laid down their life to protect our future. We are very grateful to our Bharat ke veer jawan..
is it possible to monthly donation? Made the contribution alongwith my family. Unable to download the certificates as we were not authorized (?). I wished the certificate should have been sent to email id directly. Though, I would say a sense of relief came on me that I could do a little bit for these bravehearts. Thank you Akshay sir and to our honourable prime minister for giving us a chance to contribute and support this soldiers in the way we can. One more request kindly add on private bank also for netbanking, I am finding very difficult to my part of contribution. Akshay sir aap bahut achhe insaan hai.jo shahido ke liye app lunch kiya.Bhagwan aapko bhala kare. Very good intitiative.But there is problem while making contribution. Despite repeated attempts I have failed to make payment through net banking of SBI.so payment system should be smooth and Hassel free. But I think this portal may promote the culture of support from million of citizens to their breavehearta martyr who delivered his supreme for pride of our nation. Saluate to Indian army and paramilitary troops. Akashay sir your a great person. I heartily salute you sir for this idea. Or hum asha karte h ki desh ke sabhi nagrik isme support karenge. Akshay ji is kaam ke liye mai or mera pariwar aap ko dil se salute karte hai. I am not an Indian citizen and I was not born in India. I still sincerely love and respect India and the Indian Army. Kindly advise how I can contribute from overseas to this very noble cause. Most grateful. Good idea Akshy sir this app is very helpful to jawan family …. One more thing that we need to make an awareness programme in different areas so that the needers can recieve the help. Jai Hind. I WAS ALSO THINKING OF SOME SYSTEM TO DONATE FOR SUCH ARMY PERSONELS FOR THEIR SACRIFICE. THIS PLATFORM WILL SURELY HELP THOSE FAMILIES. WE MUST PROMOTE THIS WEB PORTAL. IF someone wants to donate from outside of India like in dollars currency So can they doCould you please suggest? Thanks Akshay Ji And Hertly Salute You. IF someone wants to donate from outside of India like in dollars currency So can they do. Sir my account is in bank of Baroda which is not seen in the lists of bank….what should I do….